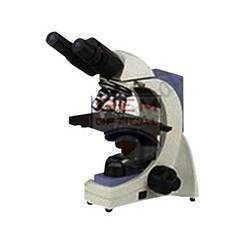 Owing to our expertise, we offer a wide gamut of pathology microscopes that include biological microscope, binocular microscope, antifungal binocular microscope and others. 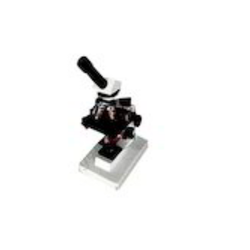 This microscope is a perfect tool to be used in hospitals, pathology labs, college labs and diagnostic centres. Further, our range is available with additional accessories and other technical specifications. Eye pieces: Our eye pieces is equipped with High Eye Point Anti Fungal. Along with this, we are also providing Anti Reflected Extra Wide Field 10x paired eye piece 20mm. Binocular eye piece tubes: All prism in this have Anti- Reflected & Anti – Fungal coatings. 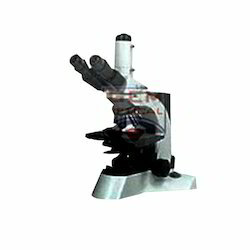 Its Binocular and Trinocular Head has 30 degree Inclination with 360 degree rotatable. Nose piece: We are giving a reversed type nose piece running on Ball- Bearing Balls ensures smooth motion. Mechanical stage: The mechanical stage is low positioned Co-axial calibrated double plate mechanical stage with feather touch movement. Our Co-Axial coarse & fine focusing mechanism is based on four step reduction gears system which runs on ball – bearing Guideways and is provided with special tension adjustment ring. Stopper system is provided so that the slides may not damage. Condenser: We are manufacturing qualitative Parabolic Aspheric Abbe Condenser NA 1.25 with rack & pinion adjustment. Light source: Our light source is 6 Volt 20Watt Halogen lamp with adjustable brightness and built in field of view diaphragm which ensures correct positioning of condenser for perfect illumination of the specimens. Eye Pieces: Our High Eye Point Anti Fungal & Anti Reflected Extra Wide Field 10x paired eyepiece 18mm. Binocular Eye Piece TubesAll prism have Anti- Reflected & Anti – Fungal coatings. Binocular and Trinocular Head having 30 degree Inclination, 360 degree rotatable. Nose PieceThese Nosepiece are running on Ball- Bearing Balls ensures smooth motion. Mechanical Stage The mechanical stage is low positioned Co-axial calibrated double plate mechanical stage with feather touch movement. Focussing Mechanism Co-Axial coarse & fine focusing mechanism based on four step reduction gears system which runs on ball – bearing Guideways, is provided with special tension adjustment ring. Stopper system is provided so that the slides may not damage. Condenser We are providing Abbe Condenser NA 1.25, rack & pinion adjustment. 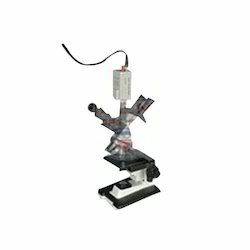 Light Source Our light source is 6 Volt 20Watt Halogen lamp, adjustable brightness, built in field of view diaphragm ensures correct positioning of condenser for perfect illumination of the specimens. Eye Pieces: We are providing eye pieces which are high eye Point Anti Fungal. They have anti reflected extra wide field 10x paired eye piece 20mm. Binocular Eye Piece Tubes: Our binocular eye piece tubes are prisms which have anti- Reflected & Anti – Fungal coatings. Our binocular and trinocular Head have 30 degree Inclination and can be rotated at 360 degree. Nose Piece: The nose piece which we are reversed type nose piece running on Ball- Bearing Balls ensures smooth motion. Mechanical Stage: Our mechanical stage is low positioned Co-axial calibrated double plate mechanical stage applied with feather touch movement. Focussing Mechanism: We are a trusted name in manufacturing focusing mechanism which has Co-Axial coarse & fine focusing mechanism based on four step reduction gears system which runs on ball – bearing Guideways, is provided with special tension adjustment ring. It is provided with stopper system is so that the slides may not damage. Condenser: Our condensers are actually parabolic Aspheric Abbe Condenser NA 1.25. These have rack & easy pinion adjustment. Light Source: We are actively manufacturing light source which has 6 Volt 20Watt Halogen lamp and has easy adjustable brightness. It has built in field of view diaphragm which ensures correct positioning of condenser for perfect illumination of the specimens. 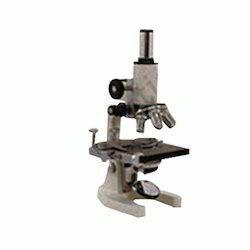 Looking for Pathology, Lab and Medical Microscopes ?